Alvin Kamara past Eagles cornerback De’Vante Bausby during the third quarter. After the Eagles' worst loss in years, it's time to hand out some grades. Find out how Paul Domowitch thinks the Birds performed, then offer up your own grades. Rookie Josh Adams had another good game, rushing for 53 yards on seven carries, including a 28-yard second-quarter touchdown run. He came into the game averaging 6.7 yards per carry on first down, and averaged 6.3 against the Saints. Because the game got out of hand so quickly, the Eagles ended up running the ball only 12 times. Carson Wentz turned in the worst performance of his young career. His 31.9 passer rating, which included no TDs and three interceptions, was the lowest of his career. Tight end Zach Ertz, who entered the game with 75 receptions, was targeted just three times and had two catches for 15 yards. Against a defense that had allowed the fifth most 20-plus-yard completions in the league, the Eagles had none. A run defense that has been bad for a while now hit rock bottom. Or at least you would hope the 173 rushing yards they gave up to the Saints was rock bottom. Poor tackling, unable to get off blocks, not filling gaps, they gave up a stunning 9.1 yards per carry on first down in the first half. 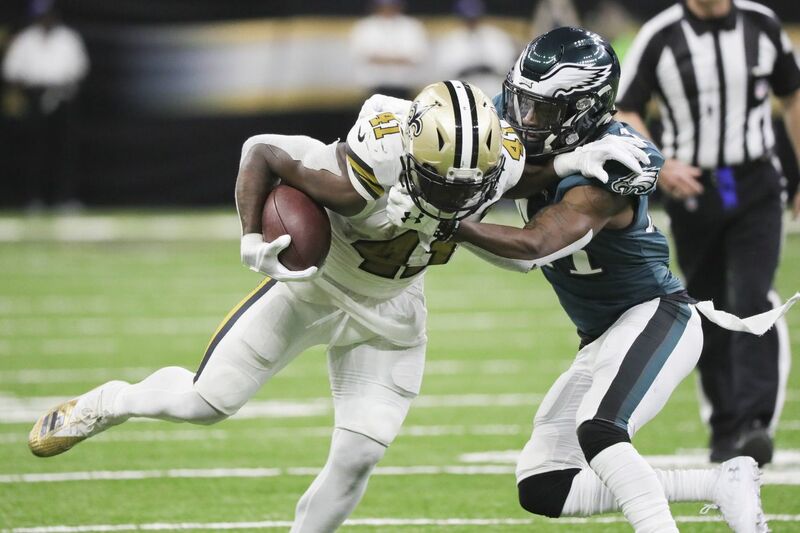 This was men against boys, particularly after cornerback Sidney Jones reinjured his hamstring and safety Avonte Maddox injured his knee, and people such as Cre'Von LeBlanc, Chandon Sullivan and De'Vante Bausby were trying to cover the Saints' receivers. Drew Brees threw for 363 yards and four touchdowns and wasn't sacked. Marking on a curve. Corey Clement had a nice 48-yard kickoff return in the first quarter, which the offense completely wasted, going three-and-out. They had some early special-teams penalties, including a hold on Tre Sullivan that wiped out another nice kickoff return by Clement, and an unnecessary roughness penalty on Richard Rodgers in the second quarter that forced the Eagles to start one drive at their 7. The injuries keep piling up. Nobody expected them to be able to stop Brees and the Saints' unstoppable passing game. But they continue to let teams run on them with ease, and, for the second straight game, their offense failed to convert a third down until late in the third quarter. It was the worst defeat ever of a reigning Super Bowl champion. We'll find out soon enough whether they're going to roll over and play dead, or pick themselves up, dust themselves off and try to win a division that's still very winnable.